Gaining an edge over your competitors means having the best business intelligence, which requires information, but every enterprise is now drowning in data. It becomes more challenging when getting into 'big data', when the process goes beyond traditional data mining techniques and database tools. Analysis on a big data scale is only possible if your business has robust server platforms that can cope with what will be an ever-expanding torrent of information. Servers that can cope with the storage needed to manage big data, but more importantly, process this data based on focused queries, have to be carefully chosen. For big data analysis, mass storage and fast processors are the key server components. Any businesses can use open source Hadoop analysis, but matching this to a server platform is the critical component to get right. Vendors in the server market now offer a number of integrated platforms that use their servers. One example is Dell's PowerEdge C hardware that couples Cloudera's distribution of Hadoop to create a powerful big data analysis platform that can be tailored to a business' precise needs. In its report on big data, IDC states: "Modular deployment of servers at hyperscale is often the preferred approach to best meet the economic challenges associated with big data. "As an example, Facebook recently announced its Open Compute Project for both data centre design and server design. By sharing its modular server design with the market, Facebook hopes to drive down the cost and complexity of hyperscale server deployments aimed at workloads such as big data analytics." Once the investment has been made in the supporting hardware or chassis that blade servers require, businesses can then start to reap the benefits of moving to this infinitely flexible platform. As a business's use of big data changes, it's important to have a server platform that can also change. Traditional servers with their fixed hardware configurations are not suitable in this scenario. Businesses that want to stay on the cutting edge of their sector by leveraging big data must have the server infrastructure to support these ambitions. Increasingly this means the flexibility that blade servers offer. Because the nature of big data is to expand with businesses having to manage many terabytes of information, a flexible server platform is a must. In these circumstances using blade servers can be an ideal solution. The main gain with blade servers is the ability to expand their number at will. 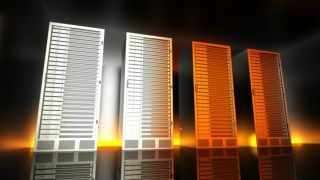 A blade server chassis can manage several servers as a whole, with the on-board memory of each server being hot swappable for easy future expansion. Also, with excellent control over individual servers, IT managers can rest assured they have a server installation that can cope with their current big data demands, and their future needs.